CJ Freshway (CEO Moon Jong-Suk), a CJ group affiliate specializing in institutional food service and food ingredient distribution, will join hands with Vietnam's largest food service company and accelerate its efforts to distribute food ingredients in Vietnam. On October 31st, CJ Freshway signed a Memorandum of Understanding (MOU) for integrated purchasing of food ingredients with Vietnamese company Golden Gate at the latter's headquarters in Hanoi, Vietnam. This signing was attended by CJ Freshway Global Strategy Planning Office head Lee Seung-Hwa, Golden Gate CEO Dao The Vinh, and others. Golden Gate is Vietnam's largest food service company and directly manages 19 food service brands and 180-odd stores across Vietnam. Golden Gate runs Korean, Chinese, and Japanese barbeque restaurants, and the company's flagship brand is Korean-style barbeque specialist "Gogi House" and "K-Pub Pocha," whose stores are dotted across Vietnam. 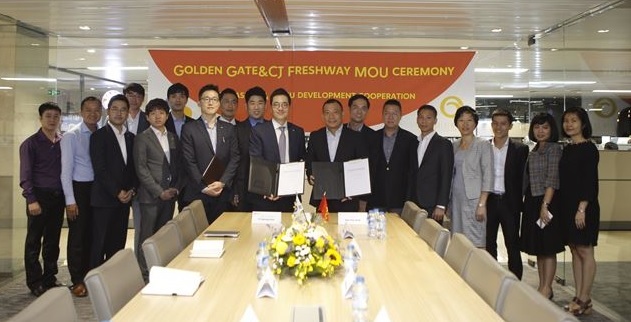 With this MOU, CJ Freshway plans to supply to Golden Gate approximately 10 billion won's worth of US-made and Australian-made beef and European-made pork on a yearly basis, as well as Korean-made food ingredients including processed foods, soy sauces, and other kinds of sauces. Based on this, CJ Freshway also plans to expand its external distribution, targeting Korean restaurants, local restaurants, and distributors in Vietnam. Provided that CJ Freshway's business in Vietnam gets to a stage of stability, the volume of supply is expected to increase to as much as 20 billion won. Among all large-scale imported meat distributors currently operating in Vietnam, only four are distributing more than 10 billion won's worth of imported meat. With this MOU, CJ Freshway is expected to become a major food ingredient distributor in Vietnam, evolving from its existing Vietnamese institutional food service business which generates annual revenues of approximately 10 billion won. Beef consumption in Vietnam is increasing by 37% annually, and their preference for Korean-style barbeque menu offerings is also increasing. In step with such a trend, Golden Gate is opening more and more branded restaurants selling Korean-style barbeque menu items, and CJ Freshway also plans to continuously increase the amount of meat supplied for such endeavors. The Vietnamese chain restaurant market is growing at an annual average rate of about 20%, and Golden Gate has achieved a sales growth of about 77% over the past two years. Meanwhile, the Vietnamese government is employing more stringent food safety standards in response to the rapid growth of the restaurant market, and food service companies and consumers are increasing their use of relatively safer imported food ingredients. 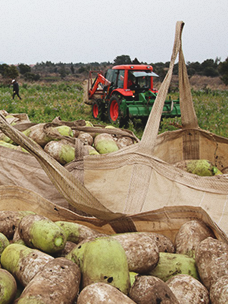 “CJ Freshway signed an MOU with Vietnamese national distributor Saigon Trading Group (SATRA) in September concerning exclusive distribution of Korean-made fresh fruits. We also signed an MOU for integrated purchasing of food ingredients with Vietnam's largest food service company Golden Gate. 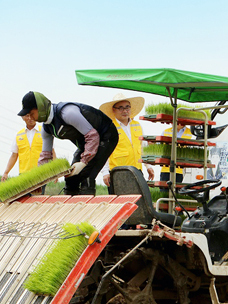 Now that we have established a beachhead to enter Vietnam's local food ingredient distribution market, we plan to speed up our business in Vietnam. In addition, we also plan to provide active support for CJ Group's efforts to globalize Korean food," said Lee Seung-Hwa, head of CJ Freshway's Global Strategy Planning Office. 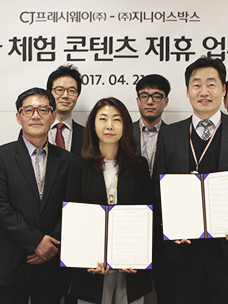 Having signed an MOU with Golden Gate, CJ Freshway is now putting efforts not only into supplying food ingredients but also into accurately promoting Korean food culture. 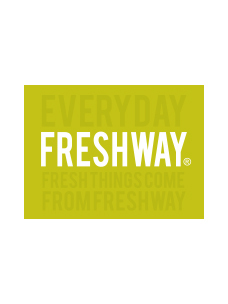 To that end, CJ Freshway dispatched a Korean chef to a Vietnamese food service company, and CJ Freshway is the first Korean B2B food ingredient distributor to have done so. The Korean chef develops Korean food menu items and runs Korean cooking programs so that the Korean food menu features sold at Golden Gate-operated Korean food brand restaurants can be executed more accurately. In addition, the chef also proposes various Korean food ingredients through his consultation on Korean food menu offerings, which is expected to lead to the export of more Korean-made food ingredients. “Vietnam has a very keen interest in Korean culture because of the Korean Wave craze. Not only Korean movies and music but also Korean food culture is very popular. However, the Korean food cooked by the local chefs often differs from the Korean food in Korea, in terms of taste, recipes, etc. So, I am helping to develop Korean food menu selections so that they can develop menu features properly. The excellence of Korean food has been recognized in many countries throughout the world, and I will try my best to contribute to exporting Korea food culture by passing along Korea food recipes," said CJ Freshway chef Kim Ji-Sam.